“I will be the gladdest thing under the sun! Millay was one of the first poets whose work I loved, and I learned this verse as a girl. I have said it silently to myself countless times over the years. It captures the joyful exuberance that I feel every spring. I hope you will feel some of this same gladness today! You’re welcome, Eileen – your photos are lovely too! I especially like the ones with animals. Thanks for visiting! In the twenties here this morning. In Georgia – go figure. Cherry tree had just begun to show the promise of blossoms. I hope the frost does not “nip them in the bud”! Yes, they moved the predicted “peak bloom time” here to early April because of the cold weather; it was originally estimated to be the last week of March. Currently it’s at 35 degrees here and possible snow flurries are predicted. But yesterday and several other days were warm. imho, *One is nearer God’s heart in a garden than anywhere else on earth* that’s is why i create gardens, plant seeds of Hope, in the gardens of my mind. Also daily seeking beautiful pictures of nature to enjoy. We are blessed today; when we unable to travel to the gardens around the world to have gifted photographers who will share their work. On facebook there are several such site. Daily i am blessed to share their pictures with my Abba’s thoughts to me in the Garden of Hope. Giving thanks for all. agape Love & prayers to you & yours. Resting in Garden of Hope. Kate, I agree that we are blessed to be able to “travel” to other places without leaving our homes. I have seen so many wondrous sites via photos and videos on the internet. Our world is magnificent and amazing, a gift from the Great Creator whose love is made evident in the beauty and variety that surrounds us. Thank you, Sheila! I will try to live up to my own words today, too. The weather here is COLD and cloudy today but I can still “dig deeper” and be gladdest. Thanks for being here! So beautiful, Julia. Happy spring. We are pretty lucky, but that said, spring is just as spectacular for me. Suddenly everything is waking up, setting blooms, doubling in size. It takes me breath away. I am so glad that you are having a lovely spring too! I imagine that gardeners enjoy that season the most. What I remember about springtime in Northern CA is the beautiful green hills and you are right, the flowers do seem to come alive then even if they are already blooming. I didn’t know you lived in Northern California. It’s a beautiful place. We honeymooned near Fort Bragg, Mendocino and San Francisco. Lots of beautiful memories of all that open space, the ocean, beaches, greens. Lovely. Yes, California will always be my adopted home. For years it was our plan to retire there, but a variety of other factors (with a big one being cost of living) it does not seem possible now. But we had two tours there and our sons spent more time in that state than any other while they were growing up. From 1990-93 we were on the central coast (Vandenberg AFB, between Santa Maria and Santa Barbara) and then 1999-2004 in Vacaville. We spent lots of time in your neck of the woods because Matt would go to weekend and summer camps at Stevens Creek Park (Camp Costanoan) and we would often stay in the Monterey area, Santa Cruz or other nearby spots while he was there. Also our sons would go to a church youth convention in San Jose every spring. I picked up a collection of Millay’s poems the other day and found I was much more drawn to her darker poetry myself. She has one on suicide that is riveting. Yes, she was definitely a complex person. Her “First Fig” and “Second Fig” seem positive at first reading, but have a darker tone just under the surface. I do love her happy poems, though. As a young girl I loved the poem “Recuerdo” and was charmed to find out what the title meant (a friend who knew Spanish told me). Flowers are such wonderful creations. Each flower, even the tiniest one, has the beauty to amaze us if we observe it carefully. That is a lovely shot. And 🙂 thanks for the mention. Enjoy the spring! Bindu, you’re welcome! I always enjoy visiting your blog and I thought others would like it too. I’m so happy to have you visit here! This is awesome! I have natural skip to my daily step and when I’m extra perky people ask ‘what’s up’ or give me the ‘did you have a triple shot this morning look?’. Now I’ll add Millay’s quote (give her props of course) and say “This is the day the Lord has made and today I’m going to be the gladdest thing under the sun!” Love it, thanks! I’m so glad you like it! This world needs more cheerful people, that’s for sure. Thanks for visiting! Winter is holding on in SE OK, even though signs of Spring are peeping out. Birds singing and the early spring flowers are covering the ground in pink. yellow. white and blue colors. Warm weather must be around the corner!~// Happy Spring! Thank you, same to you! It was in the 30’s here today, but at least the sun came out for part of the day. The Cherry Blossoms here have budded and hopefully will be in bloom soon. just sent an email with a bradford pear blossom just out our from door for yo . We also have a forecast of a dusting snow for tomorrow morning. Hope the cold doesn’t bite the blooms. Thanks Larry, I know I will enjoy the photo! Maybe the cold will be brief enough to spare the flowers. Thank you, Julia for this photo…..I don’t know how anyone could view this pic without gladness filling their heart! Thanks so much! I must admit, even looking at photos of flowers usually puts an involuntary smile on my face no matter what. I am so glad you like it and I appreciate your visits here! I’ve never been the the Netherlands yet but would love to next time we’re in Europe. What a gorgeous photo. Springs no where’s in site here so I’m glad to have this visit today. Thanks Julia. I wish I could send you a few real flowers to put in a little bud vase on your kitchen counter…but till then just pour yourself a nice steaming cuppa and count the days until you go to see Alys in Wonderland (also known as California). Know that spring WILL get here eventually! I’ll post a photo soon of some of our Azaleas which are one of the best things about living in the South! Stay warm. Awwwww, thanks Julia. Yes, we are counting the days to California and our visit. We just booked our Napa Accommodations so we’re all set now. I love Azaleas but they aren’t hardy here, so yes yes, “bring em’ on” LOL. Have a nice weekend! You will have a blast, I’m so happy for you! I don’t even drink wine but I love going to the vineyards, it’s so beautiful. Just be sure you don’t miss Sonoma County – I like it even better, especially the town of Sonoma itself. You’re welcome! I will look forward to seeing your photos and hearing about your adventures. 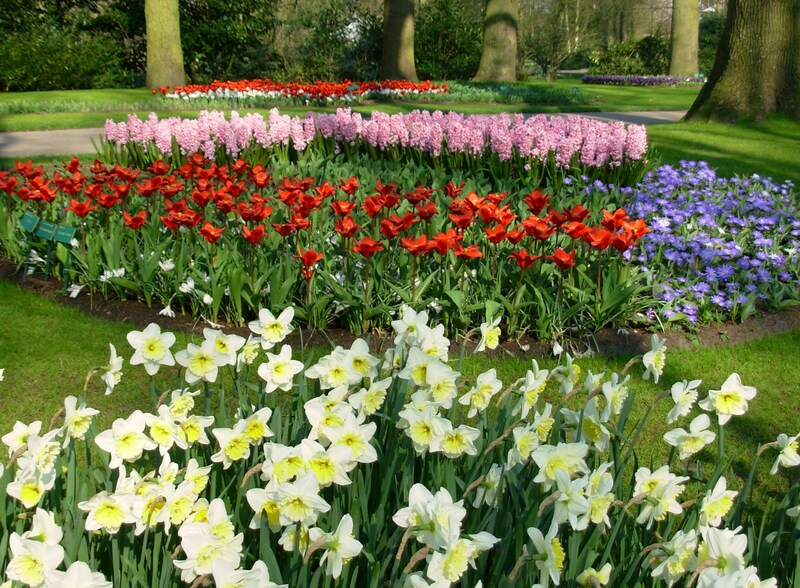 I am planning to visit Keukenhof during Easter weekend. It has been so cold this year and I am concerned that there is not much to see yet. Are the tulips or any other flowers in bloom? Many thanks! Lucky you! According to the Keukenhof website, the blooms are a bit delayed but you should be able to see at least a few tulips (click to see the website and read the note to the left in yellow under “flowering status”). I was there at almost exactly the same time you will be, almost to the day. Even if the blooms are not at their best, the grounds are lovely and they have greenhouses with all sorts of beautiful blooms. Have a wonderful time! 331,815 visits - come back any time.